While my Patriots won’t be heading to the Super Bowl this year, I’ll be watching the big game nonetheless. Any football fan knows that food is an important part of game day. One of my favorite Super Bowl meals is fried panfish and crappie are one mighty tasty option. Winter can be a great time to catch crappie. It’s cold out there, yes, but if you keep a few things in mind before heading out, you could be enjoying a plate full of fried crappie as you watch the game this year. When you’re hunting for a limit of crappie this winter, it pays to know where to look. Start your search in deep water and be sure to look for structure adjacent to a channel or drop-off. These include points, ridges, humps and flats with tight contour lines on either side of them. Check topo maps if you’re unfamiliar with a lake to get a good read on the layout. Once you find one of these areas, start looking for stumps, rock piles or brush piles near the deeper edge. In the winter months, fish will be less apt to chase lures as they conserve energy. For this reason, you’ll need to downsize and slow things down to give them a chance to make a grab. Use small jigs on the lightest line possible and work them as slowly as possible. At the slightest little tick or movement of the line, set the hook. I like Uncle Buck’s Panfish Creatures and Bass Pro Shops’ Stump Jumper jigs for this task. Experienced anglers know that the best lakes for big crappie are the ones that provide cooling water for nearby power plants. 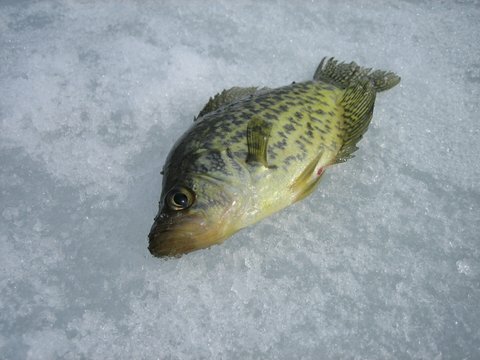 In winter, this means you’ll want to look for crappie in the warm water near discharge outlets. If there is no power plant, then the headwaters tend to be the best for winter crappie fishing. Headwaters are the source of a river or stream and crappie tend to hang around these areas in the winter because it’s usually the first place to warm up in early spring.